Thank you to Peaceable Kingdom for providing me with product in exchange for my honest review. All thoughts and opinions shared are my own. Do your kids love games? My son B certainly does. When I was growing up, playing games with my younger sister was one of my favorite ways for us to spend time together. My family loves playing games, too. Growing up, I remember my dad and his brothers making up silly games, and of course- re-writing the game rules. B has picked up on this, and loves to make up his own rules for games, which has sort of become a problem. He thinks that he doesn't have to follow the rules of the game, and gets pretty upset if he doesn't win. Why can't there be games where everyone works together and everybody wins? Wait- there are... and they're from Peaceable Kingdom. Peaceable Kingdom came onto the scene in 1983 (so they've been around as long as I've been alive), with a goal set to create fun, fresh products that educate, stimulate and inspire. It all started with just one product, and today, Peaceable Kingdom offers lots of products, ranging from greeting cards and stickers to cooperative games for all ages. Peaceable Kingdom's motto is one we should all strive to live by: 'Make good, do good, be good!' Peaceable Kingdom uses sustainable materials in their products, as much as they can- items like recycled paper, etc. B couldn't wait to see what fun was in store in this package from our friends at Peaceable Kingdom! What a great collection of games and activities! B was thrilled to see so many fun new games and activities to enjoy. He really likes the other games that we have from Peaceable Kingdom, like Stack Up, Hoot Owl Hoot, Rainy Day, and Dinosaur Escape. The neat thing about Peaceable Kingdom games is that they are mainly cooperative games, which teach kids to work together to reach a common goal. When there's just one goal, everyone wins when the goal is reached as a team! These types of games are perfect for siblings, friends, classrooms, and families. We received four really fun games and activities from Peaceable Kingdom for the holiday season, including: Lucky Dogs, The Memory Palace, Monster Sticker Activity Book, and Make a Robot Kit. The Lucky Dogs Dice Game is a fun cooperative game for kids ages 5+. We were excited to check out the Lucky Dogs Dice game. It looked so silly and fun. B really loves to roll the dice in just about any game we play, so this was right up his alley. This game requires a bit of planning ahead on the part of the players, so this was wonderful choice for B. He couldn't wait to shake up the dice and give this game a try. The game box is beautiful, and all of the pieces you need to play this fun game are included. Roll the dice and work as a team to spell out Lucky Dogs. B s this game is so much fun! This is a really fun game for our family to play together. B really enjoys it, and wants to invite some friends over to play it with him. We have family game nights on the weekends, and this is our favorite new addition! The game instructions and everything you need are included in the game box, but you can also find them online and download them as you need to. 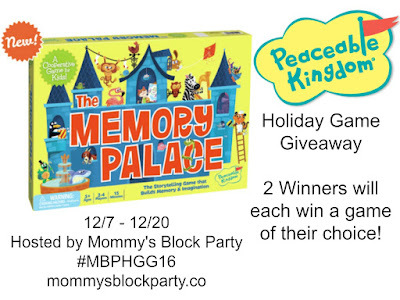 The Memory Palace Game is a new game to Peaceable Kingdom, and another favorite! This game is so much fun! It's beautifully designed, and comes with several picture tiles that can be placed together to make a story. Players take turns creating pieces of the story, and they have to remember what took place before their turn to add the next piece of the puzzle. Work together to create the ultimate story! B really loves to create fun stories with this game. I love telling stories, too, so we take turns coming up with the silliest stories we can think of. It's so much fun to watch B thin hard to remember what came before, and think up what will happen next. This game is helping him to become a storyteller like his mom. We also received the Monster Sticker Activity Book. B has been a big fan of sticker books for a long time. He enjoys creating his own sticker scenes, and I never mind him using stickers. The Monster Sticker Activity Book is one of many fun sticker books from Peaceable Kingdom. 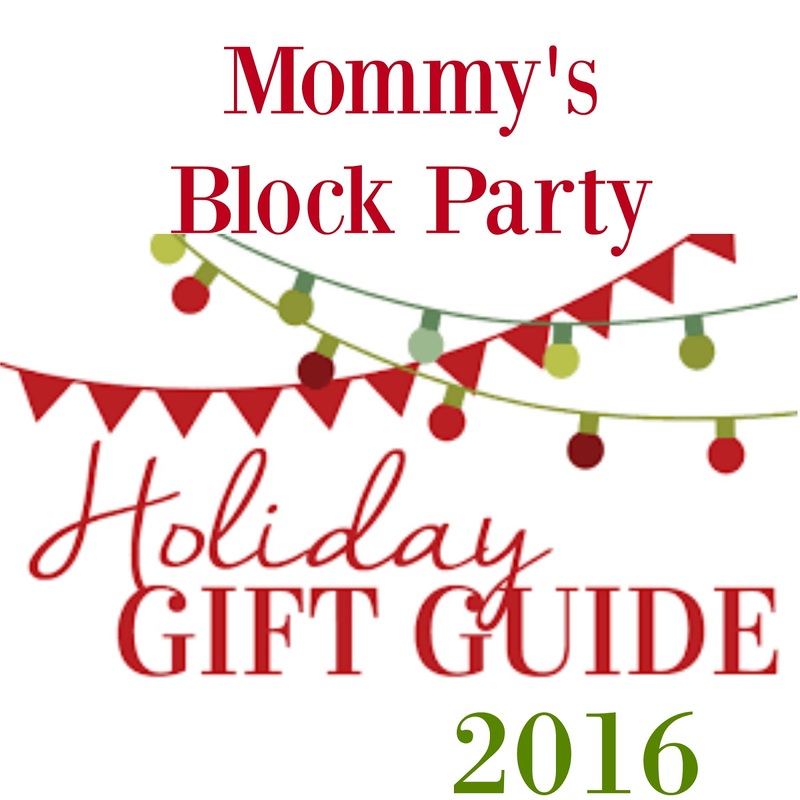 I love their sticker sets and activity books- they provide hours of mess-free fun! The best thing about this cute book, is that it comes with tons of stickers, which are repositionable! I love stickers that can be used over and over again! B couldn't wait to add stickers to the monsters faces! Check out all of these fun stickers to choose from! There are lots of other cute sticker activity books with different themes. I can't wait until S is a little older and can enjoy their cute sticker books! I know she's going to love them just as much as her brother does. These are perfect for the holidays if you're going to be traveling- they'll provide mess-free fun in the car, on the plane, or wherever you're headed! Play with Your Monsters! This fun sticker activity book features Make-A-Face Monsters, Monster Munch, a monster puzzle and imaginative sticker play. Repositionable stickers means hours of creative fun! B's favorite Peaceable Kingdom product of all- the Make a Robot Build and Play Kit! Peaceable Kingdom has lots of cool little kits with stickers. Their build & play kits allow kids to use their imaginations to create scenes, and then play with them. B is a huge fan of robots, so this was the perfect choice for him. It's a small kit, and it takes just a few minutes to put together. 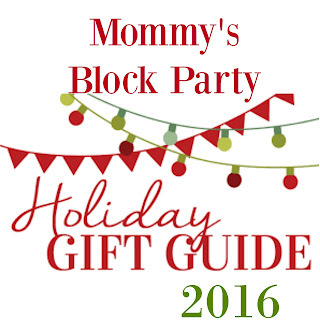 It's perfect for a rain day, an after school activity, and makes a cool stocking stuffer! B, concentrating on building his robots. The Make a Robot Build & Play Kit is so much fun! I gave all of the Peaceable Kingdom goodies to B in the same afternoon, and this is the one that he played with for 2+ hours that day. He loves building the robots, decorating them with stickers, and then acting out robot battle scenes. He loved watching their pieces fly off, and then putting them back together again. Check out all of the stickers that came with this kit! B was able to build two robots, and he had tons of stickers to choose from to decorate them, too! I even got to help decorate the blur robot, which was quite an honor. ...and can do all sorts of cool tricks! B was so proud of his robot creations! Families love this item because they can take it in the car, on a plane, into a restaurant, or anywhere you might want an engaging activity that’s easy to start and easy to clean up. I can't tell you enough about how much I love Peaceable Kingdom. They are one of my top choices in games for kids. The fact that they create cooperative games for kids and families is huge- it means that everyone gets to play, and work together to reach a common goal. They also have wonderful board games, sticker sets, cards, activities, tattoos, and more! Peaceable Kingdom games and activities are educational, and are the perfect gift for the holidays! Use them in the classroom, the playroom, the family room, and don't forget to share them with your friends! I love gifting Peaceable Kingdom games to friends and family members kiddos, and you will, too! Head on over to Peaceable Kingdom to learn more about their unique cooperative games and activities for kids! Connect with Peaceable Kingdom through Facebook, Twitter, Pinterest, and Instagram. 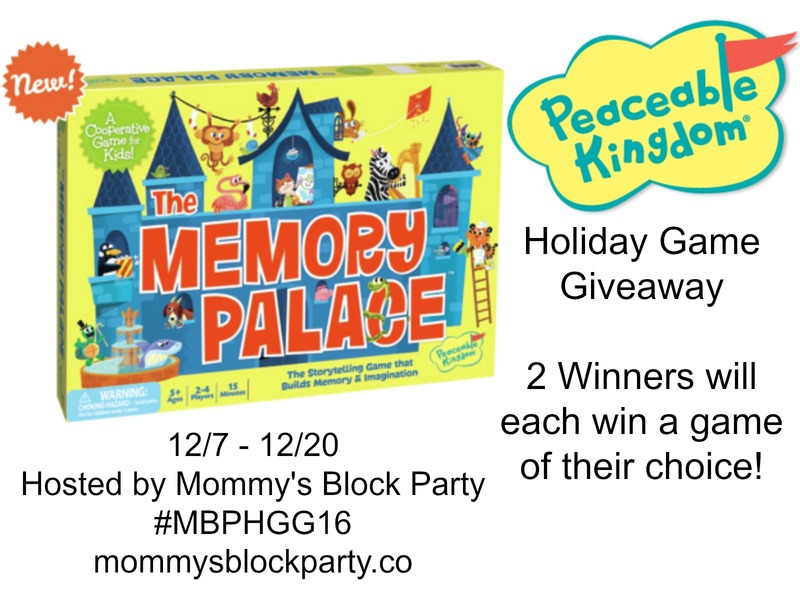 TWO lucky readers will win a Peaceable Kingdom game of their choice. Giveaway is open to US residents, 18 and older. No PO Boxes. Just use the handy RC entry form below to enter to win. MBP is not responsible for proze fulfillment. See oir policies page for details. Special thanks to Peaceable Kingdom for allowing us to share about these fun games and activity gift ideas for the holidays, and for offering this fun holiday giveaway for our readers! I also like "You Guessed It! A 20 Questions Card Game"
I would love to win Luck dog dice game or The memory palace. Thanks for the chance. Engineering ants - Its very unique, fun and creative while learning problem solving and cooperating!!! Also like the sticker fun like funny faces. My fairy-loving kids would love "The Fairy Game"
Dinosaur Escape - help the dinosaur escape. It would be fun to play with my daughter who loves dinosaurs! The award winning Hoot Owl Hoot! is also one of my favorite! Happy Owls - Great for kids on the go! Sure thing to keep kids busy! our family would have fun playing "What's It? The Game Where Creative Minds Think Alike!" My boys would love Lucky Dogs! Friends and Neighbors: The Helping Game .. Love this one. would be a great game for holiday! I also like Stone Soup - A Spicy Memory-Matching Game with Spice! Lovely tshirt tatoos - Pink Fairy - Temporary Tattoos for Clothes. Until now did not anything like this existed :) love it.